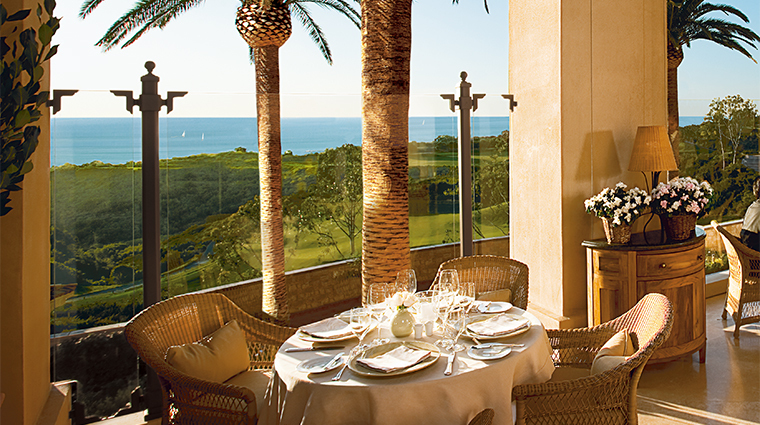 With an elegant interior of natural colors, lush potted trees and a terrace providing unparalleled views of the ocean and golf greens, you may think you're in Tuscany when you dine at Andrea at The Resort at Pelican Hill – and that's before the fresh northern Italian dishes even hit your table. The friendly service will lead you to believe this is a more casual restaurant than it is, but make no mistake, the food served here is carefully executed and well-sourced. The typical prosciutto, for example, is elevated with a Zibbibo wine-marinated melon. 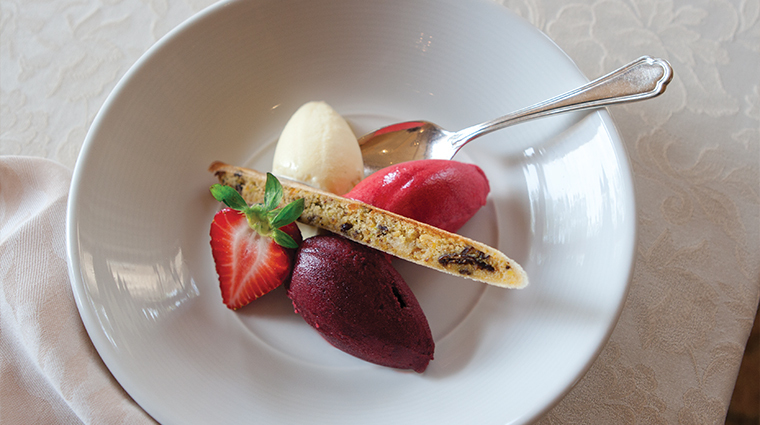 Pasta is not the only item that gets special billing here, however, as all meals should end with a scoop of the artisan gelato. If the weather is warm when you’re dining at Andrea, we recommend you opt for one of the prime ocean-view tables on the patio. Although the indoor dining room is certainly comfortable with its semicircle-shaped cozy booths and elegant potted palms, the best seats in the house allow you to appreciate the stunning views of the resort and its adjacent golf course. Expect the service at Andrea to be just like the food itself: accessible, polished and inviting. Well-versed in the fine art of making you as comfortable as possible, the knowledgeable waiters first will go over the menu with you upon arrival, noting the chef’s specialties and highlights, like the risotto that’s served tableside in a large wheel of Parmesan cheese. Start out with a light aperitivo like one of the four prosecco-based drinks and our favorite was the Andrea blush, which combines the Italian sparkling wine with blood orange purée. If you like a more potent drink, then opt for the classic Negroni made with Bombay Sapphire gin, Campari and Cinzano vermouth. Pasta is divine here. Following in the Italian tradition, the pasta is made daily in a special temperature-controlled room using only the finest Italian ingredients. The wine’s just as good as the food. Andrea boasts a great wine list that marries the best of Italy and California. 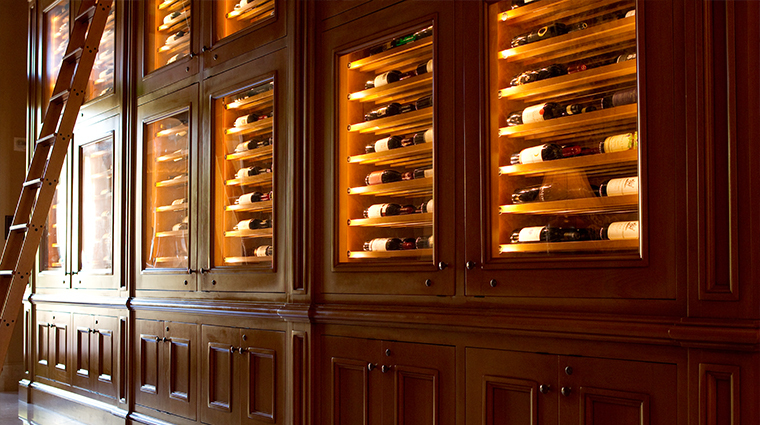 And if you choose to drink by the glass, you’ll find nearly 50 selections to tempt you. The restaurant is named after Renaissance architect Andrea Palladio (1508 –1580), who inspired the design of The Resort at Pelican Hill. Palladio championed a revival of Greek and Roman architecture and valued geometry and symmetry in his designs, which are reflected in both the restaurant and hotel. While the restaurant is open for lunch Thursdays through Sundays, the best time of day to visit is at dusk, when you can watch the sun descend over the Pacific Ocean. Make sure to reserve a table on the semi-open terrace for prime viewing. 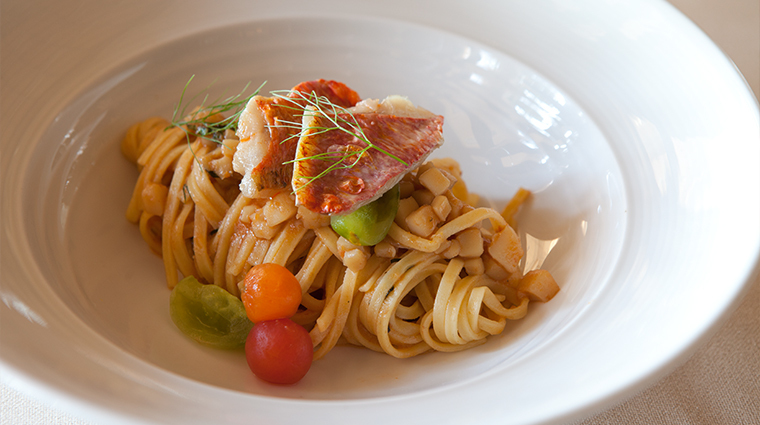 If you’re a hotel guest and want to sample Andrea’s fare without leaving the comfort of your villa, you’re in luck. 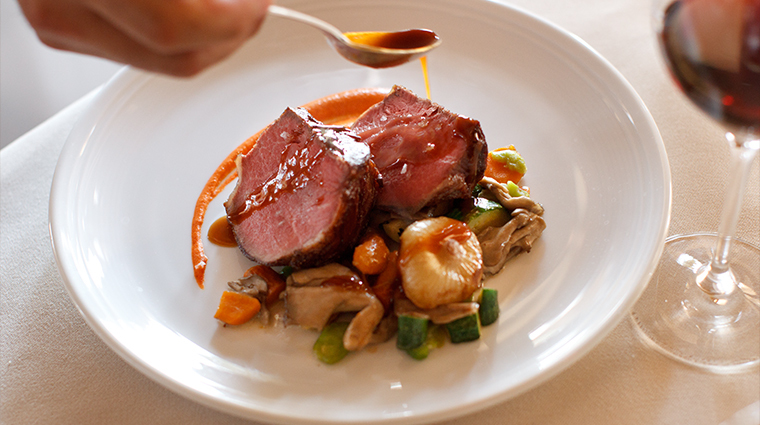 The Resort at Pelican Hill’s room service menu features selected specialties from the Orange County restaurant, including spinach and ricotta ravioli with butter and sage sauce and a braised veal shank with creamy polenta. Pasta made fresh daily with the finest Italian ingredients in a in a special pasta-making room that’s set to 68 degrees F. Our favorite on a recent visit was the saffron-flavored tagliolini with a lightly spiced king crab ragout, but for something a little richer, try the ricotta agnolotti with quail ragout, Marsala and aged Pecorino Romano. Roasted Snake River beef with bone marrow. Another specialty by chefs Jean-Pierre Dubray and Luigi Fineo, this hearty entrée showcases delicious steak from the Wagyu-style cattle producer paired with a rustic herb sauce. When we dined at Andrea, the risotto came loaded with white asparagus and truffles, although the additions do change according to the season. Served tableside, it’s finished inside a giant wheel of aged Parmigiano-Reggiano before the waiters shave the fresh fungi on top; it’s a sight to see and a treat to eat. Roasted octopus with polenta. Octopus here is as tender as can be, paired with creamy cornmeal and garnished with a corn-and-oregano salad. Like the pasta, Andrea’s gelatos are prepared fresh every day with only the best seasonal fruit and ingredients, like lavender honey and sweet local strawberries. Located just off the lobby of The Resort at Pelican Hill, Andrea features an airy and classically inspired interior design that employs a neutral color palette. The hotel and its restaurant were inspired by Andrea Palladio, a Venetian Renaissance architect who valued symmetry and restraint, while also integrating natural motifs into his designs. The sandy color scheme at Andrea highlights the gorgeous blue ocean and greenery just outdoors. A highlight of the restaurant’s main dining room is a skylight that’s lit from within, and tall rectangular windows overlooking the semi-enclosed terrace. Most of the tables are padded half-moon booths flanked by potted palms and small wooden lamps, though you’ll also find smaller tables with padded armchairs. Light wood trim lends a stately feel to the room, and tables are spread far apart from each other to ensure your privacy. The exterior design is noteworthy, too, primarily for the breathtaking views you’ll get through the partially glassed-in archways that line the terrace.